So, how many tents does a backpacker need? Well, like any good question of this sort, the answer is “it depends”. 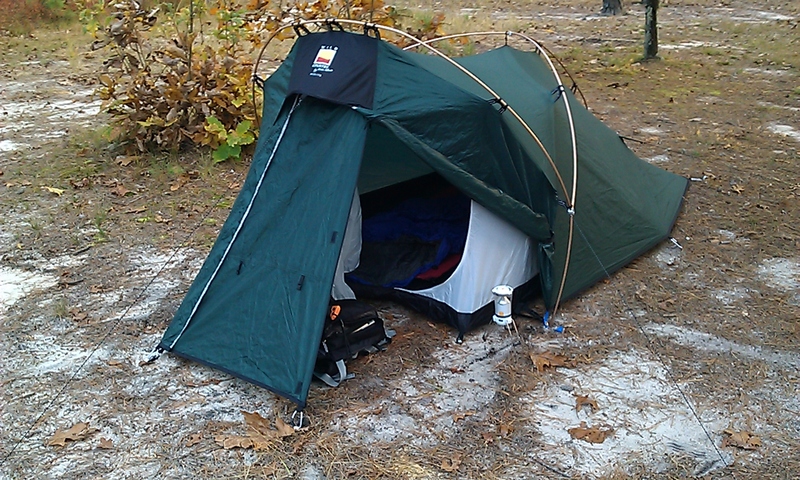 Do you camp in different environments, or in different seasons? Do you always camp solo, or always with a partner? If you are willing to make some compromises (in size, weight, style, and cost) then you can probably get away with just one tent, even if you camp in different conditions and group sizes. If you are willing to carry a heavier 2-3 person, freestanding, 3+ season tent all the time, then one tent may do it for you. Three-plus season, solo (or tight two-person), free-standing, double-wall tent with removable fly for nice summer weather. 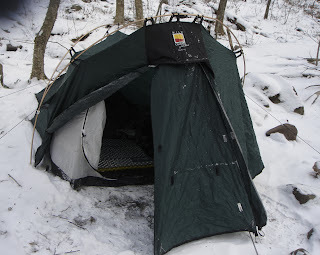 Because I love winter camping, a dedicated, double-wall tent made sense. One with a semi-freestanding (semi-geodesic) design, that pitches fly-first or all-in-one for foul weather. Room for two in shoulder seasons, where that extra room can be used for storing extra gear for one in freezing, snowy conditions. 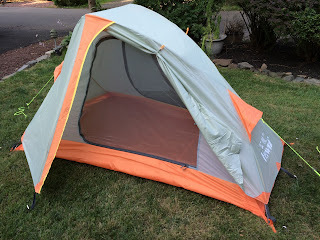 This led to the purchase of my Terra Nova Wild Country Duolite tent - it is bomb-proof, well insulated, pitches easily and fast in poor weather, and (being mostly freestanding) it doesn’t require a ton of guying points to remain stable. Unfortunately, the inner tent can’t be used alone in fine weather, and at just over 5 lbs it’s a little heavy for solo hiking in better weather. You can see my review here. As most of my backpacking is solo and in the shoulder seasons (late Fall and early Spring), I wanted a lightweight tarp-style tent that could be easily erected with a single trekking pole, without need for a mesh inner unless used in the summer when bugs are fierce. My Luxe MiniPeak 2 fit the bill perfectly. It is a pyramid tent that is cavernous for one person (with tremendous headroom), that has plenty of room for two if needed. With just the outer fly, it weighs right around 2 lbs; and even with the single-person bug bivvy inner nest it weighs less than 3 lbs. On the rare occasions that I camp with two in the summer, I can always use the inner nest for one person, and my Jungle Sleeping Bag with integrated bug mesh for the second camper; and there is still plenty of room for gear. The main issue with this tent is that it is not freestanding, and needs to be securely staked and guyed to remain pitched. If camping in rocky conditions, above treeline, pitching can be a problem even with rock-slings. See my review here. Okay, my third tent was a little more a ‘want’ than a ‘need’. I wanted a freestanding tent for use in rocky or poor ground conditions, that was an inner first pitch design with removable fly. That way I could keep the tent open to breezes and views in nice weather, but button things up in rain, cold, or snow. The Hewolf 1601 was a nice inexpensive option, that had plenty of room for one plus gear, or a tight squeeze for two in a pinch. While I could have found a lighter option, the Hewolf (at almost 5 lbs) is rated for 4-season use; so, this is another option for solo winter camping (particularly if I’m concerned less about wind, and more about guy-out points). Read my review here. I guess that I could get by with any one of these tents by itself, but with compromises that I’d rather not make. I probably use my MiniPeak about 75% of the time I’m backpacking, with the Duolite taking up the the 25%. The Hewolf will live in my bug-out-bag and fill in when I really need a freestanding tent - once it gets some trials under its belt, we’ll see if it supplants one of the other tents. So, in reality, I need two tents, but want three (plus a hammock, too).